We have published almost 500 blog posts on the 100%Open blog over the last decade. The great thing about blog posts is that they are not meant to be perfect and they just reflects a series of thoughts at a moment in time. It goes without saying that sometimes these posts are more insightful than others so here are a few that I think seem to have stood the test of time with the benefit of hindsight (in order of oldest to most recent). How to Measure Open Innovation Value – The very first 100%Open blog post when we launched 100%Open 8.5 years ago by David making the case that with open innovation, different things matter to different partners so need to be understood and measured separately. Don’t Predict, Prototype! – A post outlining a process we have developed with various clients to avoid analysis paralysis when faced with longer term scenario planning and to create a simple method to classify and cluster what’s important and what’s urgent and what to do about it. Unleashing Customer Innovation with LEGO Ideas – A summary blog post about the recent history of open innovation at LEGO on the launch of the LEGO Ideas platform that we played a small role in shaping as one of our first big projects, which remains one of our most popular posts ever even years later. 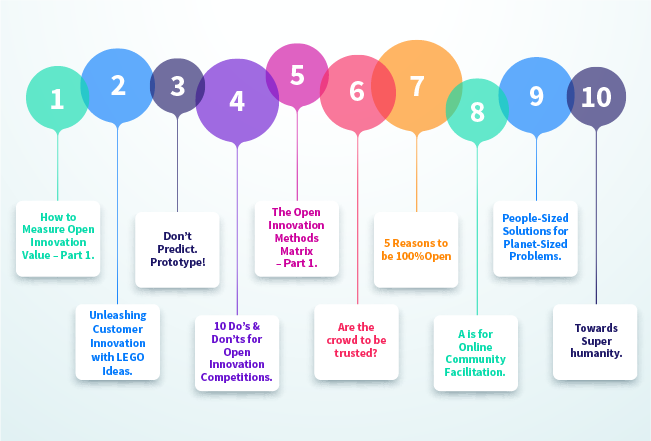 10 Do’s and Don’ts for Open Innovation Competitions -This post is based on practical experience of designing and running many competitions and synthesises our top 10 lessons learned from working with UBS, Ordnance Survey and the Colombia CO4 open innovation challenges about what it takes to run a successful global or national open innovation challenge. The Open Innovation Methods Matrix – A very popular post with a simple overview of the 9 main methods that we have observed, developed and learned over the years about where to start with open innovation with the lowest risk and lowest reward options bottom left and the highest risk and highest reward options top right. Are the Crowd to be Trusted? – A great post by our Design Director Murray, all about the hilarious but also insightful experience of a UK Research Council who chose to crowdsource the naming of their new navel vessel only for people to not take the whole exercise quite as seriously as intended, and what they did in response, with good lessons applicable for any crowdsourcing exercise as well. 5 Reasons to be 100%Open – A lovely first post by relatively new member of the team Cristina on her decision to join the 100%Open from her native Moldova and what attracted her to coming to London and also working in the field of open innovation, which has helped to shape and codify our behaviours and company culture. A is for Online Community Facilitation – An awesomely alliterated post by our very talented Head of Crowds, Katie, who describes the effortless art and considerable science of managing and moderating online innovation communities effectively so that you get good ideas, the right kind of participation and excellent outcomes. People Sized Solutions for Planet Sized Problems – A short post inspired by a few 100%Open projects, notably Go Detroit and UBS Grand Challenge, where we were trying to tackle major social problems (mobility and climate change respectively) but through influencing the commercial business model of a multinational company and the individual behaviours of local communities. Towards Superhumanity – A wide ranging post inspired by months of reading and working around the subject of artificial intelligence and machine learning, and making the case for more collective focus as we move into a brave new world of enhance humans and realistic robots. This topic then formed the based on one of our best Union Network events last December. If you haven’t read any of these posts before I hope there is something interesting or insightful there for you to take away. Otherwise we always welcome guest blogs, or suggestions for topics so please do get in touch if you have an idea that you would like to discuss or see featured.